Former Temple defensive tackle Terrance Knighton, now with the Jacksonville Jaguars, taught current Owls Adrian Robinson and Muhammad Wilkerson the tricks of the trade. 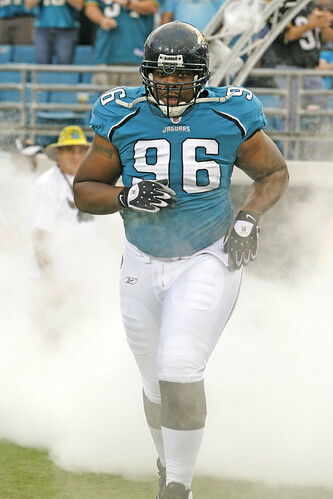 HARRY SCULL JACKSONVILLE JAGUARS Rookie defensive tackle Terrance Knighton runs onto the football field in a Jacksonville Jaguars’ game earlier this season. Knighton has recorded 31 tackles, half a sack and one forced fumble in 12 starts. The National Football League’s Jacksonville Jaguars sit at second place in the AFC South with a 7-5 record. Though the Indianapolis Colts have already clinched the division, the Jaguars remain on the hunt for one of the conference’s two wild-card playoff berths. While rookie defensive tackle Terrance Knighton, a third-round pick in the 2009 NFL Draft, continues to prepare for a possible trip to the postseason, he has not stopped keeping tabs on his alma mater, the Temple football team. With a 9-3 overall record and a 7-1 finish in the Mid-American Conference, the Owls will be competing in a bowl game for the first time since 1979. And Knighton says he will be there. During Knighton’s four-year collegiate career, the Owls won 10 games total, including an 0-11 campaign his freshman season. That year, 2005, he played in 10 games and started the season finale against Navy. He finished the season with 17 tackles, 3.5 tackles for loss and one forced fumble. In 2008, his senior season, Temple improved to 5-7 under the direction of third-year coach Al Golden. Knighton became the Owls’ first First-Team All-MAC selection after accumulating 54 tackles, five breakups, three fumble recoveries, a blocked kick and a sack. Twelve games into his first NFL season, Knighton has 31 tackles, half a sack and one forced fumble in 12 starts. After the usual Sunday football game, Knighton settles into a routine. The Jaguars watch game film and lift Monday. Following a day off Tuesday, they have what Knighton called “long days” Wednesday and Thursday, which begin at 6:30 a.m. and last until 6 p.m. The team has a walk around Friday and then travels Saturday. Knighton also returned during Jacksonville’s bye week to talk to the Owls before their Oct. 24 game against Toledo [Temple won, 40-24]. He said he gave his former teammates tips on how to take care of their bodies and how to game plan based on what he had learned from his time in the NFL. Fellow Jacksonville defensive tackle John Henderson, a two-time Pro Bowl selection, taught Knighton “tricks on defense,” he said. Knighton has since passed them onto Temple’s sophomore defensive linemen Adrian Robinson and Muhammad Wilkerson. Robinson earned Defensive Player of the Year honors in the MAC this season with a school single-season record 12 sacks (which placed him 10th nationally), a team-best 12 tackles for loss and five forced fumbles. Wilkerson earned First-Team All-MAC honors on the strength of his 56 tackles, nine tackles for loss, seven sacks and four breakups. “[Robinson’s] a hungry player who wanted to be great,” Knighton said. “He was always watching film and asking questions. He just loves the game of football, and teammates and coaches can tell. Knighton has had to make the transition from being a senior leader and team captain like he was with Robinson and Wilkerson back to being a rookie. On hot days during summer training camp, he said veterans would make him and the other rookies carry their pads. He also got a new haircut and participated in dancing contests. And on the flight back from the Oct. 11 Seattle game, his teammates gave him a new nickname. “Pot Roast,” as Knighton’s teammates now call him, continues to work on improving his play after facing teams like the Colts, which he called the toughest opponent to date because of their “complex offense and attention to detail,” and upcoming opponents like the New England Patriots, the team he cheered for growing up in Windsor, Conn.
“Like everything, I can always get better,” Knighton said. “I’ve got to stay on top of my game. I can’t be complacent. One week, an opposing team might be hot or might be down a little bit, but [regardless] I’ve got to be consistent to stay in this league for years. The former Temple Owl was the 72nd overall pick in the 2009 NFL Draft. It was an eventful year in Temple Athletics.